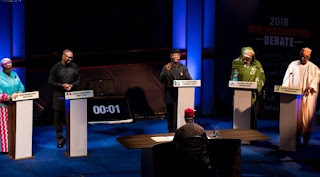 The vice presidential candidate of the All Progressives Congress, Yemi Osinbajo; and that of the Peoples Democratic Party, Peter Obi, on Friday disagreed on the state of the economy and the subsidy regime. 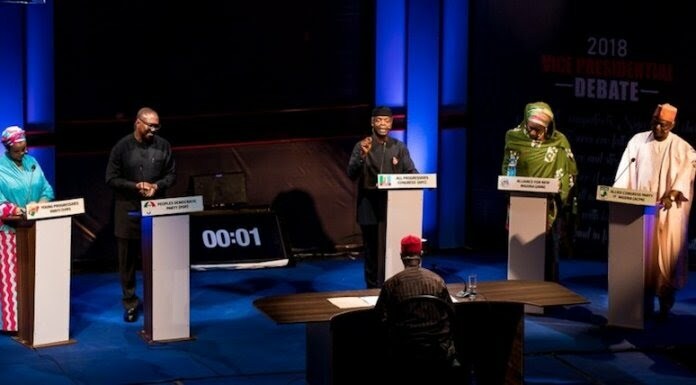 They both spoke at a debate jointly organised by the Nigeria Election Debate Group and Broadcasting Organisation of Nigeria in Abuja for vice-presidential candidates of five political parties. Also at the debate were candidates of the Alliance for New Nigeria, Mrs. Khadijah Abdullahi-Iya; Allied Congress Party of Nigeria, Ganiyu Galadimawa and Young Progressives Party, Mrs Umma Getso. While Obi claimed the economy had failed to improve under the APC’s government, Osinbajo said the economy had grown in leaps and bounds over the last one and half years. Replying, Osinbajo said, “If the shop is not secured, the thieves will empty it.” He added that the treasury must be secured while the looters must be prosecuted to recover the stolen funds. Obi lamented that no fewer than 87 million Nigerians were living in poverty with economic indices not favourable to the country. “The crisis Nigeria is witnessing today is because we have not been able to create jobs. Nigeria debt is unsustainable because 50 per cent of its resources is used to service the debt.” But disagreeing, Osinbajo said the economic challenges faced today were due to the failure of the PDP government to build the infrastructure in its 16 years of misrule. “Nigeria has suffered major infrastructure deficit over the last 16 years. We need strong infrastructure to build the economy. There is no way Nigeria could have survived under the PDP with massive corruption.” According to him, Nigeria went through 16 years of no social reinvestment and infrastructure decay under the PDP which slowed down its economic prosperity. “We have spent N2.7tr on infrastructure development despite earning 60 per cent less than the PDP government,” he added. Obi claimed the unemployment rate went from 26 per cent in 2015 to 40 per cent in 2018. He added that the country lost N2.1tr at the stock exchange in the last three and half years of the APC government. The former Anambra State governor canvassed the removal of fuel subsidy and redirection of the money to critical sectors like education and health. This, he said, would improve the human development index of the country. “Subsidy is a waste, we need to reverse it. If you can remove it and do the right things, the prices of petroleum will come down because you are only paying for the delay at the sea port,” he said. In their contributions, Getso said Nigerians must vote for those that would secure the future of their children. “We can’t allow the people that destroyed our party to come back and build our future for us,” she said. Abdullahi-Iya said her party would ensure human development and diversify the economy. “We are putting the economy before the policies. It is the economy that drives the policy,” she added.